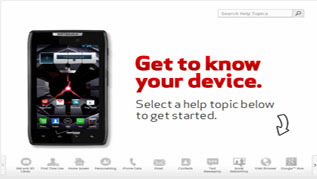 Find device-specific support and online tools for your Droid Razr by Motorola. Here's how to remove or delete apps if your RAZR / RAZR MAXX is unresponsive, freezes or an app won't open. Here's how to turn pre-installed apps on your DROID RAZR / RAZR MAXX on or off. A step-by-step guide for using voice actions in Google Now on your DROID RAZR by Motorola. Learn how to use Google Now on your Droid Razr by Motorola. Discover how to search Google Now on your DROID RAZR by Motorola. A step-by-step guide for downloading an app on your DROID RAZR by Motorola. Learn how to uninstall an app on your DROID RAZR by Motorola. Learn how to view different map layers on your DROID RAZR by Motorola. Learn how to search locally on your DROID RAZR by Motorola. Learn how to use your voice to activate turn-by-turn navigation on your DROID RAZR by Motorola. A visual guide to adding a trigger or action on your DROID RAZR by Motorola. An interactive guide to creating a rule on your DROID RAZR by Motorola. A step-by-step guide to removing a trigger or action on your DROID RAZR by Motorola. Explore how to temporarily disable all rules on your DROID RAZR by Motorola. Learn how to temporarily disable a trigger or action on your DROID RAZR by Motorola. Discover how to add a view to VZ Navigator on your DROID RAZR by Motorola. A visual guide for exiting VZ Navigator on your DROID RAZR by Motorola. An interactive walkthrough for using VZ Navigator to navigate to a location on your DROID RAZR by Motorola. Explore how to search locally in VZ Navigator using your DROID RAZR by Motorola. A visual guide for setting VZ Navigator alerts on your DROID RAZR by Motorola.